A tooth infection usually comes with pain that may be acute or go away with time. But just because the swelling and pain goes away doesn’t mean that the infection is gone. You need to visit your dentist Richmond Hill immediately because if the infection is treated early, you may still get to keep your tooth. Tooth decay is what causes serious tooth infection. This happens because the decay leaves the pulp chamber open and prone to bacteria attack. The nerves inside the pulp chamber are open hence the pain and sometimes swelling. Most people will have a filling done to cover the pulp chamber from injection. Fillings can breakdown and cause the same issue to recur. Acute pain: When your tooth is deeply decayed, the infection has reached the pulp chamber causing either acute or chronic pain. Chronic pain lasts much longer. Acute pain is what most people experience and when it is caused by a root canal infection, it can be very excruciating. You need to visit the local dental office Richmond Hill and have it addressed. In many cases, the dentist will recommend taking pain medication such as ibuprofen as well as anti-inflammatory drugs. The pain may go away temporarily when the tissue in the pulp chamber dies. However, this doesn’t mean that the infection has gone. 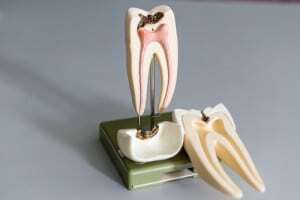 The infection will slowly travel to the rest of the mouth including to the bone tissue and you may begin to feel the pain whenever you bite on the tooth. Dental abscess: This is another issue in family dentistry that is often addressed at the dental office. When the infection has spread to the roots and into the bone, if left untreated, it can cause an acute or chronic abscess to develop. The thing with dental abscess is that it is a silent infection. This simply means that you may not experience any pain or symptoms that make you feel it at all. It is still possible to save your tooth by seeking treatment as early as possible. Significant decay: Tooth decay should never be ignored as it could be a sign of a serious periodontal disease that may require root canal treatment. Tooth decay exposes your healthy teeth to infection. If it goes untreated for too long, you may have to deal with serious issues like permanent tooth loss. Tooth decay is one of the top problems that family dentistry addresses. It affects both children and adults. Some people are at higher risk of experiencing cavities than others due to lifestyle habits like smoking or conditions that compromise their immune system as well as treatments like chemotherapy. It is important to discuss with your dentist what options you have for treatment. If you are suffering from a serious tooth infection, you need to speak to a dentist who will help you review your options. Tooth infections have been thoroughly covered in general dentistry and you’ll never miss a treatment option that suits you. You may consider having a root canal treatment with a temporary or permanent crown. A temporary crown is likely to wear out with time whereas a permanent one will last for a lifetime with proper care and maintenance.